Abstract: This case report describes the management of a 16-year-old female patient who presented with mental nerve paraesthesia which developed during orthodontic treatment. The diagnosis was determined based on history taken, clinical and radiographic examination. Treatment involved removal of fixed appliances in the lower right quadrant, a referral to the Oral and Maxillofacial Surgery department and regular follow-ups until full resolution of symptoms. Clinical relevance: Isolated mental nerve paraesthesia requires prompt investigation. Although uncommon, it may occur as a result of orthodontic treatment. This case demonstrates and raises awareness to clinicians regarding its rare occurrence. Author notes: Yuliya Sharkouskaya, BDS, MFDS RCS(Ed), Specialty Dentist, Special Care Dentistry, Bristol Dental Hospital, George Earl Read-Ward, BDS(ULond), MSc(ULond), FDS MOrth RCS(Eng) FDS(Orth) RDS(Edin), Specialist Orthodontist, MidWessex Clinic, Unit 16 Ashfield Trading Estate, Ashfield Road, Salisbury, Wiltshire, SP2 7HL, Alistair Morton, BDS, FDS RCS(Edin), Associate Specialist in Oral Surgery, Oral and Maxillofacial Surgery Department, Salisbury District Hospital, Annalise McNair, BDS, MFDS RCPS(Glasg), MSc(Ply), MOrth RCS(Edin), DDS(Bristol), FDS Orth RCS(Edin), Consultant, Orthodontic Department, Salisbury District Hospital, Salisbury NHS Foundation Trust, Odstock Road, Salisbury, Wiltshire, SP2 8BJ, UK. 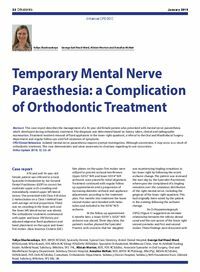 Objective: To demonstrate that, although uncommon, isolated mental nerve paraesthesia requires prompt investigation and may occur as a result of orthodontic treatment.